Lamborghini Gallardo LP560-4 | What Car? So 520bhp and 375lb ft of pulling power aren't enough for you? Fair enough, try this for size: the uprated Lamborghini Gallardo now has a 5.2-litre V10 that develops 549bhp and 390lb ft of pulling power. That equates to a 0-62mph time of 3.7 seconds, although, impressively, its achieved with an 18% reduction in carbon dioxide emissions from 400g/km to 328g/km. To cope with this, the manual and optional sequential shift gearboxes have both been modified to be faster and slicker. In addition, the four-wheel drive transmission system is now lighter and stronger to enable it to handle the extra power and torque. The chassis has also been stiffened to improve handling and the brakes upgraded to ensure that you can still stop in time after unleashing all that brute force. Just in case onlookers fail to appreciate the full potency of the car, the exterior styling has been made even more aggressive. The interior, meanwhile, remains unchanged. 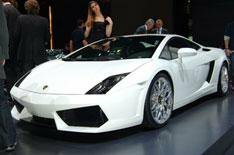 What this will do to the current Gallardo's 126,350 price remains to be announced.